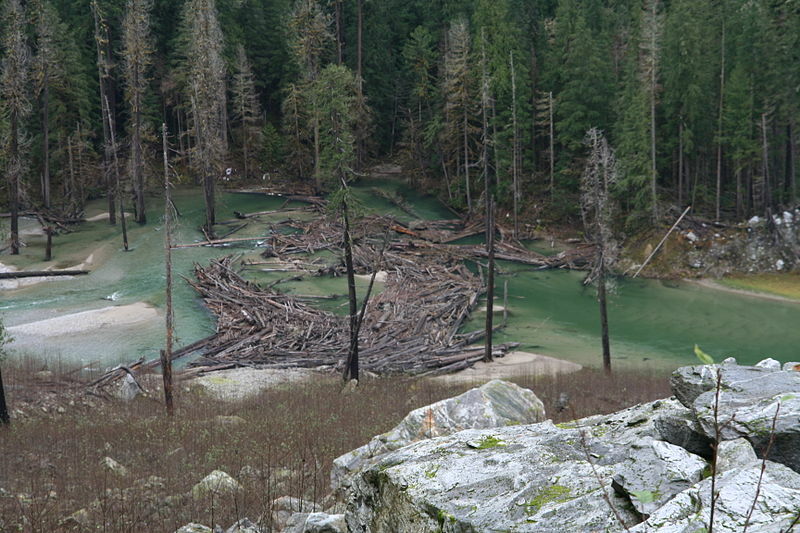 Imagine hundreds of logs jamming a river, interrupting its flow. A logjam. More generally, a logjam is any delay or blockage that prevents situations from moving forward smoothly. Now picture a frozen river whose ice suddenly shatters, sending water gushing forth. That's a literal de_____, and a figurative one is any total, sudden disaster. Just like it sounds, a logjam is a group of logs jamming up a river, interrupting its flow. And figuratively, a logjam is a delay or a blockage that interrupts the flow of a process or situation, usually because there's too much stuff (or too many people) jammed into that process or situation. You might see this word written with a hyphen (log-jam) or as two words (log jam), but today the most common way to write it is one word: logjam. "Logjam" is useful and fun to say, and it places a concrete image in your listener's mind. Call something a logjam when it's either the delay itself or the problem that's causing the delay. Or, talk about actions, events, and situations that create logjams, cause logjams, worsen logjams, etc. Different advisors insisted on taking my thesis in different directions, creating a logjam. People hoping to emigrate to the United States often encounter a regulatory logjam that's impossible to break through. Look away from the screen to explain the definition in your own words. You’ll know you understand what "logjam" means when you can explain it without saying "jam" or "impediment." From our previous issue: Think of a character who's teen royalty, someone who rules the school. Is the most felicitous name for this character Regina George, Cady Heron, or Janice Ian? Why? Answer: Regina George. "Regina" is Latin for "queen," and "George" suggests any of the King Georges of England. In fact, Regina George dominates her school in the movie Mean Girls. Try this today: What’s the most felicitous name for a love interest who's distant, cold, beautiful, and dazzling: Emma, Ermengarde, or Estella? Why? 2. We hired more staff members, who helped _____ the logjam of customer inquiries.